The Sound Beehive Experiment monitors the development of a bee colony on the basis of the sounds it generates. For this purpose, we developed a beehive that is equipped with sensors, microphones and cameras. We made sure that this equipment is not hindering the bees in their daily action. 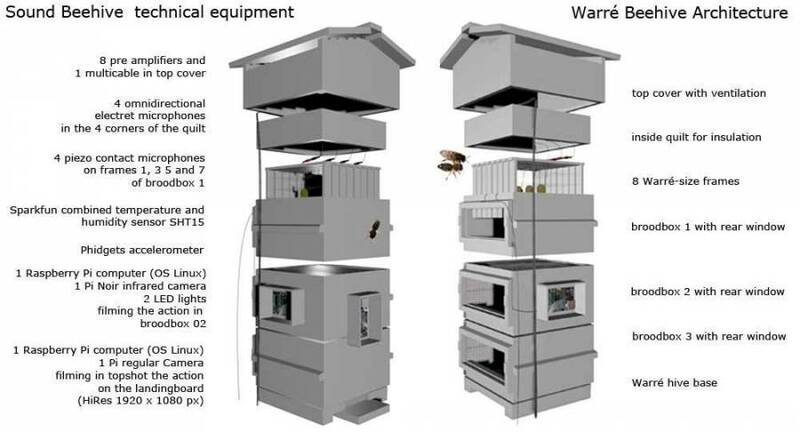 The Sound Beehive is installed in our field laboratory on a rooftop in the Brussels city centre. Inspired by the flight routes of city honeybees and looking at where they are going and what they are bringing back, I am setting up the Urban Corridors project. It is remarkable to see how a bee population functions and evolves very much in accordance to the human activites we are developing around them: gardening and urban agriculture.